OAKLAND, Calif. — For a moment, just imagine if LeBron James and the Cleveland Cavaliers lost to the Toronto Raptors in the second round of the playoffs. Now imagine those Raptors moving on to the NBA Finals, eventually getting swept by the league’s best team, the 2017 champion Golden State Warriors. What would the commentary be surrounding James right now? In today’s hot-take culture and with all the in-progress legacy judging, what sort of scrutiny would James be facing on a daily basis? • Are these Warriors best team ever? Here’s why that question is relevant: James, at age 32, just ended this Finals run short of winning a fourth championship. Now let’s step back to 1995 for a moment. That year, a 32-year-old Michael Jordan lost in the second round of the playoffs to the Orlando Magic, a team that eventually got roasted in the Finals by the Houston Rockets in a sweep. Jordan’s attempt at winning his fourth title came up short — well short, in fact. James has already graduated to no longer playing against just the opponents in front of him and instead must grapple with an invisible man to feed the appetite of the modern sports fan. Jordan hasn’t taken a shot in the NBA in 14 years and hasn’t played a playoff minute in almost 20, since sweeping past Bryon Russell and the Utah Jazz in 1998. Jordan’s body of work has aged like the fine red wine James will be drinking over the next few weeks as he decompresses from a fifth Finals loss. Of course, the circumstances are different. Jordan took 18 months off after his first three title runs to play baseball. During that same span in James’ career, he has been busy dragging two Cleveland teams into the Finals to be series underdogs. Jordan got a pass for losing to the Magic because he came back midseason that year. But a case could be made he had an advantage because he had fresh legs. He certainly didn’t come back expecting to lose in the playoffs; he came back to win the title that the Rockets walked away with. When was the last time James got a pass for anything? Maybe for the 2015 Finals, when Kevin Love and Kyrie Irving were stripped away because of injuries and the Cavs lost in six games to the Warriors. It didn’t feel like a pass when James spent the past year being told he was a Draymond Green Game 5 suspension away from having lost three straight Finals. James averaged 35.8 points, 13.3 rebounds and 8.8 assists in the 2015 Finals. He finished this year’s with averages of 33.6 points, 12 rebounds, and 10 assists, becoming the first player to average a triple-double in the Finals. This, after passing Jordan as the all-time leader in playoff scoring. Despite what critics might think, that is not the résumé of a loser. James has been to the Finals eight times, six of those as the Vegas underdog. Give that poker hand to anyone else in NBA history and see how many come up with three titles. See how many more could’ve been so statistically dominant in defeat as James has been. We constantly hear about Jordan being a spotless 6-0 in the Finals, but we don’t hear that Jordan was 6-7 in getting to the Finals in his 13 postseasons, and James is now 8-4 in his 12 postseasons. “This is my eighth trip to the Finals, and I’ve had some pretty good ones in my day,” James said after his team bowed out in Game 5 on Monday night. A year ago, with the Cavs looking as if they were going to lose again to the Warriors, Hall of Famer Jerry West gave a full-throated defense of James’ career, his face turning red as he stood on the floor of Oracle Arena. 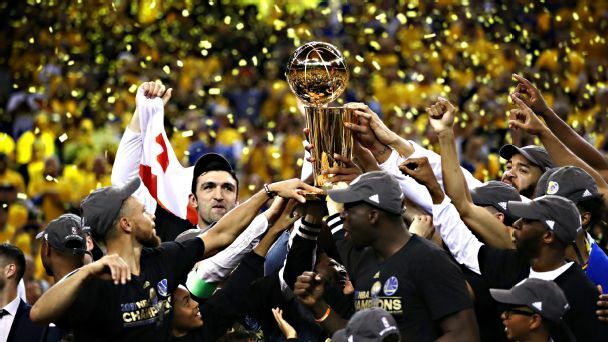 “You do your best, you try your best, you play your best and you’re still not good enough to get your team to where you want to go, and that’s to be last man standing,” said West, who lost in the Finals eight times before winning. West once almost punched a heckler who criticized him for his Finals record when he was jogging through his neighborhood in Los Angeles in the offseason. Imagine if he’d had Twitter. Monday night, James pulled on a black hat and walked into the Oakland night with his head held high and his shoulders back, declaring he accepted the outcome because he’d left all of it on the floor. Using the Simple Rating System, the chart below shows that Michael Jordan’s Finals teams were juggernauts. They entered the championship series as the top team in the league in SRS five of six times. Basketball Reference describes SRS as a rating system based on average point differential and strength of schedule. LeBron James’ Finals teams, on the other hand, entered the Finals as the better SRS team only twice, but they played the best SRS team five times, including the past three meetings with the Warriors. Queen’s “We Are the Champions” was still echoing and with fireworks exploding outside when Irving had his say. The point guard, his right quad and lower back barking after suffering a hard fall during Game 5, rubbed his face as he expressed his feelings on the Cavaliers’ leader. “I think that some people would say that he’s on the toe of — like he’s on the line of greatness. But that guy is way over. Man, he’s freaking awesome,” Irving said. Yes, LeBron James is 3-5 in the Finals. But his legacy has never been more intact.